A current Full Suite or Pro subscription, If you're on an old plan or want to check you can refer to the instructions here. We don't support Windows 7 however we have found that the app works on these operating systems. If you'd like to have a go at installing and using the SuiteFiles Drive app on Windows 7 you will need to have either Microsofts .net framework 4.6.2 or a later version installed. If you don't have this installed you are likely to see an error message 'SuiteFilesExplorerPackage has stopped working'. You may get a prompt from Windows asking if you are sure you want to run this program, if you downloaded the installer from SuiteFiles then click Yes. 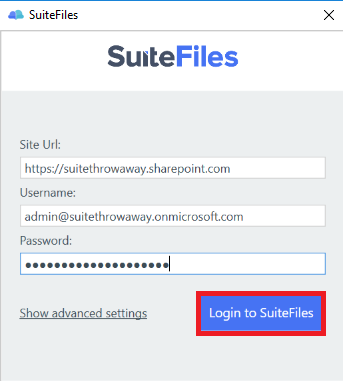 Once installed you should get a login screen where you will need to enter your SuiteFiles URL, your Office 365 username and your Office 365 password. You do also have advanced settings which you can read about here. NOTE: If you don't see a login screen as in the below screenshot, you will need to open the login window with the help of these instructions. 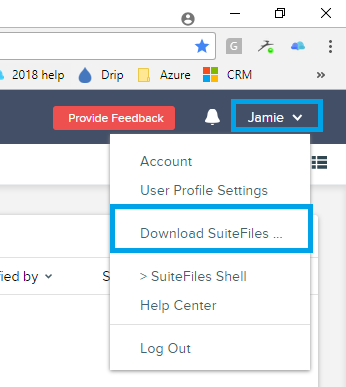 If the SuiteFiles Drive window doesn't disappear or SuiteFiles Drive doesn't show up in the File Explorer then you will need to restart the app by using the instructions here. 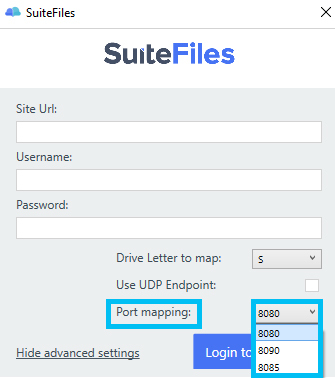 Through the advanced settings option on the login window you can change the following things SuiteFiles Drive uses: the drive letter it's mapped to, the port is uses and the endpoint it uses. By default the app will check which Drive letters are being used and map to one which isn't in use. 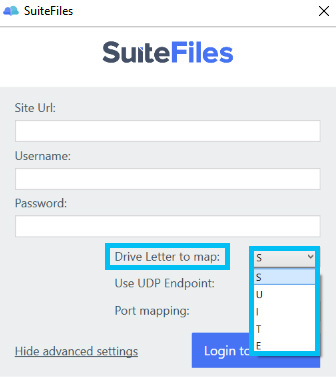 The letters our Drive uses are S U I T and E. If all of these Drive letters are taken up then you may need to remap another network drive to a different letter. By default the port used by SuiteDrive will be 8080 however this port can be in use by other applications. The common app we find already taking up this port is the MYOB connector add-on. Our app will detect this and change the port our app is mapped to so it works. If you need to check the port it's going to use or you'd like to change which port it's using you can select one from the Port mapping drop-down. The ports your're able to select are 8080, 8085 and 8090.